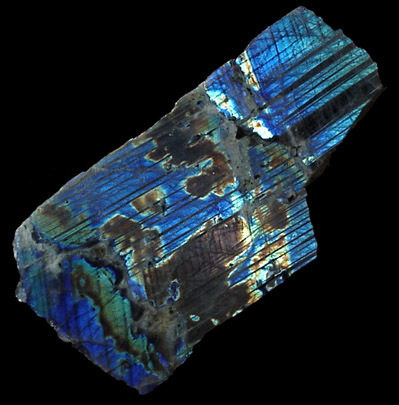 Labradorite: Mineral information, data and localities. From the occurrence at Ford Harbour, Paul Island, Labrador, Canada (Nain anorthosite). A plagioclase feldspar with an albite : anorthite molar ratio ranging from 30 : 70 to 50 : 50. An intermediate member of the Albite-Anorthite Series. Originally found at Ford Harbour, Paul Island, near Nain, off the east coast of Labrador, Newfoundland and Labrador [56° 30' N, 61° 30' W]. 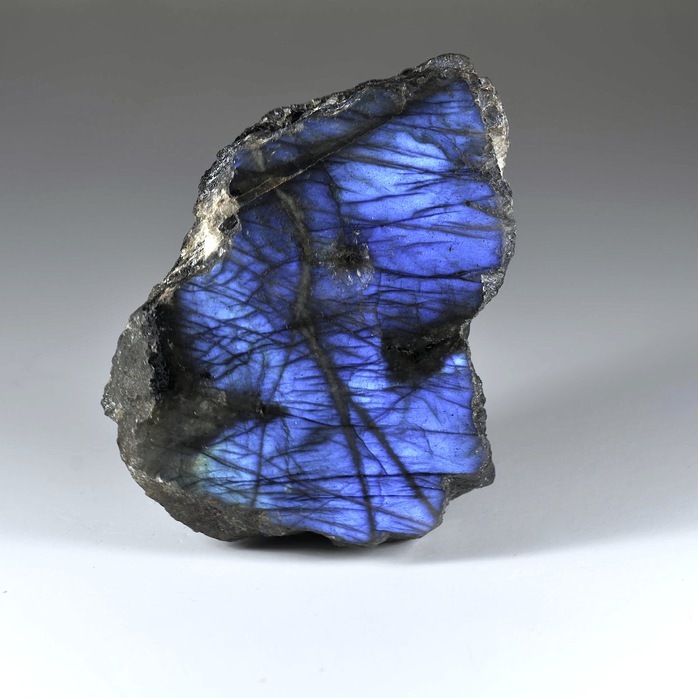 Visit gemdat.org for gemological information about Labradorite. 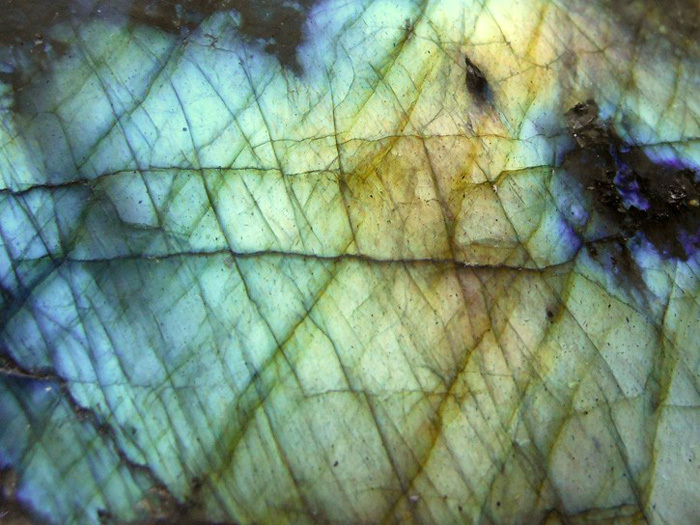 Lynx Eye Variety of labradorite with green iridescence. Oregon Sunstone Sunstone with inclusions of copper instead of hematite. Spectrolite A variety of labradorite showing strong labradorescence due to very fine exsolution of K-feldspar. Hypersthene 6 photos of Labradorite associated with Hypersthene on mindat.org. Chabazite 2 photos of Labradorite associated with Chabazite on mindat.org. Albite-Anorthite Series 1 photo of Labradorite associated with Albite-Anorthite Series on mindat.org. Calcite 1 photo of Labradorite associated with Calcite on mindat.org. Ilmenite 1 photo of Labradorite associated with Ilmenite on mindat.org. Fassaite 1 photo of Labradorite associated with Fassaite on mindat.org. Stilbite subgroup 1 photo of Labradorite associated with Stilbite subgroup on mindat.org. Jasper 1 photo of Labradorite associated with Jasper on mindat.org. Mica Group 1 photo of Labradorite associated with Mica Group on mindat.org. Magnetite 1 photo of Labradorite associated with Magnetite on mindat.org. Rose. G. (1823): Über den Feldspat, Albit, Labradorit und Anorthit, Annalen der Physik und Chemie, Vol. 73/NF-43, 175-208. Acta Crystallographica (1988): B44: 344. 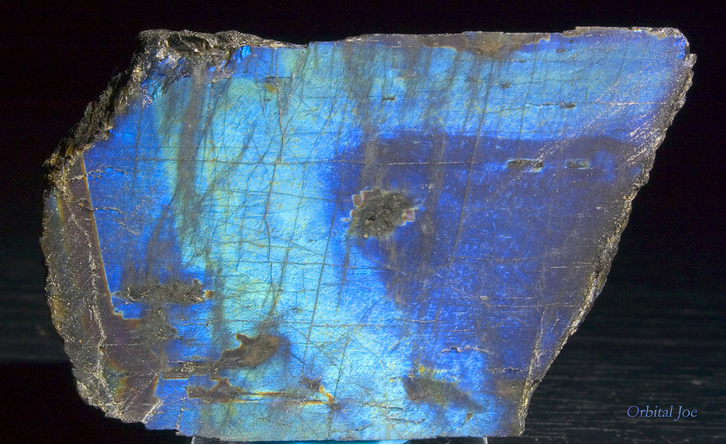 Hans Boysen & Stefan Kek (2015): The modulated structure of labradorite. Zeitschrift für Kristallographie - Crystalline Materials 230, 23–35. The following Labradorite specimens are currently listed for sale on minfind.com. Eur. J. Mineral. , 1996, 8, pp. 625-638. J.P. Lorand and J.Y. Cottin, Bull. Minéral. , 1987, 110, pp. 373-378. Hodge-Smith, T. (1924) Notes on the occurrence of Zeolites, Ardglen, New South Wales. Records of the Australian Museum 14(3): 213–222. Chalmers, R.O. (1941) The petrology of the Five Islands, Port Kembla, New South Wales. Records of the Australian Museum 21:1, 27–42. Hudson, D. R., Wilson, A.F. (1966): A new occurrence of sapphirine and related anthophyllite from Central Australia. Geological Magazine 103, 293-298. Shayan, Ahmad (1984) Hisingerite material from a basalt quarry near Geelong, Victoria, Australia. Clays and Clay Minerals, Vol 32, No.4, pp 272-278. Simpson, Edward S. (1951) Minerals of Western Australia Vol 2 (Facsimile ed. 1984). Hesperian Press, Carlisle, Western Australia (p158). LIBOWITZKY, Eugen, FRIEDL, Daniela V. & KOLLER, Friedrich (2012): Ein ungewöhnlicher Fund von Molybdänit im Gabbro von Nonndorf, NÖ. (Moldanubikum, Böhmische Masse).- Mitt. Österr. Miner. Ges., 158, 21-25, Wien. Heritsch, H. (1963) : Exkursion in das Kristallin der Koralpe. In : Mitteilungen des Naturwissenschaftlichen Vereines für Steiermark, Band 93, 1963, p. 178 – 198. Santos, W. M. D. (2012). Mineralogia e geoquímica da bauxita derivada do anortosito, Barro Alto, Goiás. Dissertação(Mestrado em Geologia)—Universidade de Brasília, Brasília, 2011. Wandji, P., Wotchoko, P., Bardintzeff, J. M., & Bellon, H. (2010). Late Tertiary and Quaternary alkaline volcanism in the western Noun Plain (Cameroon Volcanic Line): New K-Ar ages, petrology and isotope data. Geochemistry, Mineralogy and Petrology, Sofia, 48. Evans, D. T. W., Geo, P., Dickson, W. L., and Geo, P., 2004, Dimension Stone in Newfoundland and Labrador, Department of Natural Resources, Newfoundland and Labrador, Open-file NFLD 2865, pp. 52. Traill, R. J., 1970, A Catalogue of Canadian Minerals, Paper 69-45. E. William Heinrich (1962): Some mineral occurrences near Eau Claire, Ontario. Can. Mineral. 7, 314-318. Eur. J. Mineral. , 1995, 7, pp. 1251-1272. Cisternas, M.E., and Hermosilla, J. (2006): Mineralium Deposita 41, 339-355. Woolley, A.R. (1987) The Alkaline Rocks and Carbonatites of the World. Part I: North and South America. British Museum (Natural History) and University of Texas Press. Yusheng Zhai, Yongliang Xiong, Shuzhen Yao, and Xinduo Lin (1996): Ore Geology Reviews 11, 229-248. Liangshu Shu, Ping Deng, Bin Wang, Zhengzhong Tan, Xinqi Yu, and Yan Sun (2004): Science in China, Series D (Earth Sciences), 47(8), 673-688. Zheng, W., Mao, J. W., Pirajno, F., Zhao, H. J., Zhao, C. S., Mao, Z. H., & Wang, Y. J. (2015). Geochronology and geochemistry of the Shilu Cu–Mo deposit in the Yunkai area, Guangdong Province, South China and its implication. Ore Geology Reviews, 67, 382-398. Chuanxian Lin and Zheru Zhang (1984): Acta Mineralogica Sinica 1984(1), 12-20. Shen Ping, Shen Yuanchao, Liu Tiebing, Li Guangming, and Zeng Qingdong (2007): Journal of Asian Earth Sciences (in press). Roesler, Max (1917) Geology of the Iron-Ore Deposits of the Firmeza District, Oriente province, Cuba, AIME Transactions, p. 77-127. Houzar, S., Němec, D.: Skarn se scheelitovým zrudněním u Hostákova na Třebíčsku. Časopis pro mineralogii a geologii, 1985, roč. 30, č. 4, s. 409-415. C. Cotonian et al. , Bull. Minéral. , 1988, 111, pp. 89-95. Ch. Lefèvre and Ph. Cocusse, Bull. Minéral. , 1985, 108, pp. 189-208. G. Trolliard et al. , Bull. Minéral; , 1987, 110, pp. 439-448. Ambert, P., Balestro, F., Laroche, M., Figueroa, V. and Rovira, S. (2014) Technological aspects of the earliest metallurgy in France: ‘furnaces’ and slags from La Capitelle du Broum (Péret, France). Historical Metallurgy 47(1), 60-74. Handbook of Mineralogy; Miyashiro, A. and T. Iiyama (1954) A preliminary note on a new mineral, indialite, polymorphic with cordierite. Proceedings of the Japan Academy: 30: 746-751. Smithsonian, Global Volcanism Program, monthly reports. Civetta L., D’Antonio M., Orsi G., Tilton G.R. (1998): The geochemistry of volcanic rocks from Pantelleria Island, Sicily Channel: petrogenesis and characteristics of the mantle source region. Journal of Petrology, 1453-1491. Brizzi G., Meli R. (1996) - I minerali della formazione ofiolitica dell'Impruneta (FI). - Riv. Mineral. Ital., 20 1: 81-98. Huzita, K., et al. (1971) Geology and Geomorphology of the Rokko Area, Kinki District, Japan. Journal of Geosciences, Osaka City University, 14, 71-124. Zyunpei Harada (1936) Chemische Analysenresultate von japanischen Mineralien. journal of the Faculty of Science, Hokkaido Imperial University, Series IV, Vol 3, #3-4. T. Kato (1922) Japanese Journal of Geology and Geography, 1, #3-4, 77-116. Kato, T. (1924) Japanese Journal of Geology and Geography, 3, #2, 59-70. Rakotondrazafy, A.F.M., Giuliani, G., Ohnenstetter, D., Fallick, A.E., Rakotosamizanany, S., Andriamamonjy, A., Ralantoarison, T., Razanatseheno, M., Offant, Y., Garnier, V., Maluski, H., Dunaigre, C., Schwarz, D., and Ratrimo, V. (2008): Ore Geology Reviews 34, 134-154. El Adnani, M., Plante, B., Benzaazoua, M., Hakkou, R., & Bouzahzah, H. (2016). Tailings weathering and arsenic mobility at the abandoned Zgounder Silver Mine, Morocco. Mine Water and the Environment, 35(4), 508-524. Speight, R. (1943) The Geology of Banks Peninsula-a Revision. Transactions of the Royal Society of New Zealand: Vol. 74, Part III, 232-254. Wodzicki, A., Weissberg, B.G. (1970) Structural control of base metal mineralisation at the Tui Mine, Te Aroha, New Zealand. New Zealand Journal of Geology and Geophysics, 13:3, 610-630. Kinosaki, Y. (1941) Jour. Min. Soc. Korea, 24, 12. Cadow, R. (1993): Sm - Nd and Rb - Sr ages of hornblende clinopyroxenite and metagabbro from Lillebukt Alkaline Complex, Seiland Igneous Province. Norsk Geologisk Tidsskrift, 73, # 4, pp. 243 - 249. Mason, R. (1967) Electron-probe microanalysis of coronas in a troctolite from Sulitjelma, Norway. Mineralogical Magazine: 36: 504-514. Geological Survey of Norway. The Industrial Mineral Database. Deposit Area 1101 - 604, Krokavatnet Nord. Geological Survey of Norway. The Industrial Mineral Database. Deposit Area 1101 - 602, Litletjørna. Geological Survey of Norway. The Industrial Mineral Database. Deposit Area 1101 - 613, Løgjen. Geological Survey of Norway. The Industrial Mineral Database. Deposit Area 1101 - 611, Moifjellet. Geological Survey of Norway. The Industrial Mineral Database. Deposit Area 1101 - 612, Piggsteintjørna. Geological Survey of Norway. The Industrial Mineral Database. Deposit Area 1101 - 607, Slåsholmen. Geological Survey of Norway. The Industrial Mineral Database. Deposit Area 1101 - 606, Soltjørna. Geological Survey of Norway. The Industrial Mineral Database. Deposit Area 1101 - 614, Ulvhus. Evans, A.M. (1997): An Introduction to Economic Geology and its Environmental Impact. Blackwell Science Ltd (Oxford), 370 pp. R. Hekinian et al. , Bull. Minéral. , 1985, 108, pp. 691-698. I.I Likhanov et al., Eur. Journ. Mineral. , 1995, 7, pp. 379-389. Plotinskaya, O. Y., Grabezhev, A. I., & Seltmann, R. (2015). Rhenium in ores of the Mikheevskoe porphyry Cu-Mo deposit, South Urals. Geology of Ore Deposits, 57(2), 118-132. Shchukina, E.V., Afanasiev, V.P., Lobov, K.V., Malygina, E.V. and Pokhilenko, N.P., 2017, March. New data on the composition of tagamites of the Popigai astrobleme. In Doklady Earth Sciences (Vol. 473, No. 1, pp. 333-337). Pleiades Publishing. Yefimov, M.M., et al (1986), ZVMO: 115(6): 720-721; Bukanov, V.V. (1989) ZVMO: 118(2): 104-110. Ivanov, O. K. (1975): Pumpellyite from the Saranovsk chromite deposit at the Urals. Trudy Sverdlovskogo Gornogo Instituta im. V. V. Vakhrusheva 106, 146-148 (in Russian). Eur. J. Mineral. , 1993, 5, pp. 1227-1233. M. Le Guen de Kerneizon et al. , Bull. Minéral. , 1982, 105, pp. 203-211. Weibel, M. (1955): Contributions to Mineralogy and Petrology 4, 379-411. Agarwal, A., Reznik, B., Kontny, A., Heissler, S., & Schilling, F. (2016). Lingunite-a high-pressure plagioclase polymorph at mineral interfaces in doleritic rock of the Lockne impact structure (Sweden). Scientific reports, 6. Soloviev, S. G., Kryazhev, S. G., & Dvurechenskaya, S. S. (2019). Genesis of the Maikhura tungsten-tin skarn deposit, Tajik Tien Shan: Insights from petrology, mineralogy, and fluid inclusion study. Ore Geology Reviews, 104, 561-588. Schwaighofer, B., & Müller, H. W. (1987). Mineralogy and genesis of the Pugu Hill kaolin deposit, Tanzania. Clay Minerals, 22(4), 401-409. Bauer, G.R. (1970) The Geology of Tofua Island, Tonga. Pacific Science, 24, 333-350. Eastwood, T., Hollingworth, S.E., Rose, W.C.C., and Trotter, F.M. (1968) Geology of the country around Cockermouth and Caldbeck. Memoirs of the Geological Survey of Great Britain. ; Fortey, N.J. (1978) Mineral parageneses of the Harding vein tungsten deposit, Carrock Fell mine, Cumbria. Mineralogy Unit Report n° 228, Institute of Geological Sciences. ; Cooper, M.P. and Stanley, C.J. (1990) Minerals of the English Lake District: Caldbeck Fells. Natural History Museum Publications, London, 160 pp. (referring to Eastwood et al., 1968 and Fortey, 1978). Howie, R.A. (1963) Kaersutite from the Lugar sill, Ayrshire, and from alnöite breccia, Alnö Island, Sweden. Mineralogical Magazine, vol. 33, n° 263, 718-720. Gurov, E. P., Kelley, S. P., Koeberl, C., & Dykan, N. I. (2006). Sediments and impact rocks filling the Boltysh impact crater. In Biological processes associated with impact events (pp. 335-358). Springer Berlin Heidelberg. ; Gurov, E. P., Shekhunova, S. B., & Permyakov, V. V. (2015). Accessory and opaque minerals in impact melt rocks of the Boltysh structure, Ukraine. Meteoritics & Planetary Science, 50(6), 1139-1155.
http://www.pegmatite.ru/; Bobrov A.B. (2014) Golovynske deposit of labradorite and gabbro-norite. OBJECT A3-2. IAGOD Field trip. Anthony, J.W., et al (1995), Mineralogy of Arizona, 3rd.ed. : 329-330; Cooper, J.R. (1961), Turkey-track porphyry - a possible guide for correlation of Miocene rocks in southeastern AZ, AZ Geol. Soc. Digest: 4: 17-35. Anthony, J.W., et al (1995), Mineralogy of Arizona, 3rd.ed. : 329-330; Cooper, J.R. (1961), Turkey-track porphyry - A possible guide for correlations of Miocene rocks in SW AZ, AZ Geol. Soc. Digest: 4: 17-35. Graeme, R. (1993), Bisbee revisited, Mineralogical Record: 24: 421-436. Anthony, J.W., et al (1995), Mineralogy of Arizona, 3rd.ed. : 329-330; Cooper, J.R. (1961), Turkey-track porphyry -- a possible guide for correlation of Miocene rocks in southeastern AZ, AZ Geol. Soc. Digest: 4: 17-35. MRDS database Dep. ID #10048294, MRDS ID #M800426. Anthony, J.W., et al (1995), Mineralogy of Arizona, 3rd.ed. : 329-330; Cooper, J.R. (1961), Turkey-track porphyry-A possible guide for correlation of Miocene rocks in southeastern AZ, AZ Geol. Soc. Digest: 4: 17-35. Anthony, J.W., et al (1995), Mineralogy of Arizona, 3rd.ed. : 329-330; Cooper, J.R. (1961), Turkey-track porphyry - A possible guide for correlation of iocene rocks in southeastern AZ, AZ Geol. Soc. Digest: 4: 17-35. Anthony, J.W., et al (1995), Mineralogy of Arizona, 3rd.ed. : 317, 329-330; Cooper, J.R. (1961), Turkey-track porphyry - A possible guide for correlation of Miocene rocks in southeastern AZ, AZ Geol. Soc. Digest: 4: 17-35. Schrader, F.C. & J.M. Hill (1915), Mineral deposits of the Santa Rita and Patagonia Mountains, AZ, USGS Bull. 582: 301. Lindgren, W. (1926), USGS Bull. 782: 143-145. A.I.M.E. Ore Deposits of the Western States (1933): 511. Sharp, W.E. (1959) Minerals from Los Angeles County, California. Printed privately, Los Angeles, California: 4; Pemberton, H. Earl (1983), Minerals of California; Van Nostrand Reinholt Press: 360. Miller, William John (1934), Geology of the western San Gabriel Mountains: University of California Los Angeles Pub. Math. and Physical Sci. : 1: 15-17; Higgs, Donald Val (1954a), Anorthosite and related rocks of the western San Gabriel Mountains, southern California: Univ. Calif., Dept. Geol. Sci. : 30: 177; Murdoch, Joseph & Robert W. Webb (1966), Minerals of California, Centennial Volume (1866-1966): California Division Mines & Geology Bulletin 189: 183. Blackerby, B.A. (1968), Convolute zoning of plagioclase phenocrysts in Miocene volcanics from the western Santa Monica Mountains, California: American Mineralogist: 53: 954-962; Pemberton, H. Earl (1983), Minerals of California: 360-361. Andersen, Olaf (1917), Aventurine laboradorite from California: American Mineralogist: 2: 91; Murdoch, Joseph & Robert W. Webb (1966), Minerals of California, Centennial Volume (1866-1966): California Division Mines & Geology Bulletin 189: 183. Richmond, Gerald Martin (1939), Serendibite and associated minerals from the New City Quarry, Riverside, California: American Mineralogist: 24: 725-726; Murdoch, Joseph & Robert W. Webb (1966), Minerals of California, Centennial Volume (1866-1966): California Division Mines & Geology Bulletin 189: 280. Merrill, F. J. H. 1914. Geology and Mineral Resources of San Diego and Imperial Counties: Gems, Lithia Minerals. California State Mining Bureau, San Francisco, Cal. California State Printing Office, December. Chapter 1, pages 61-110. Larsen, Esper Signius and Draisin, W.M. (1948), Composition of the minerals in the rocks of the Southern California batholith. International Geologic Congress, 18th. Session, Great Britain, 1948, part 2: 66-79; Pemberton, H. Earl (1983), Minerals of California; Van Nostrand Reinholt Press: 364. Schooner, Richard. (1958): The Mineralogy of the Portland-East Hampton-Middletown-Haddam Area in Connecticut (With a few notes on Glastonbury and Marlborough). Foye, Wilbur G. (1926): The occurrence of thulite at Haddam, Connecticut. American Mineralogist: 11: 210. Hitchcock, Charles, 1861, Seventh Annual Report to the Board of Maine Agriculture. Espenshade, G. H. and Boudette, E. L., 1964, Geology of the Greenville Quadrangle Maine, US Geological Survey Quadrangle Map GQ-350. Espenshade, G. H. and Boudette, E. L., 1967, Geology and Petrology of the Greenville Quadrangle, Piscataquis and Somerset Counties, Maine, US Geological Survey Bulletin 1241-F, p F1-F60. McHone, J. Gregory and Trygstad, Joyce C. (1982) Mesozoic Mafic Dikes of Southern Maine, Maine Geology, Bulletin 2, Geological Society of Maine, p. 16-32. Gilman, R., 1978, Bedrock Gepology of the Newfield 15' Quadrangle, Maine, ME Geol Surv OF-78-10. Sears, John Henry (1905): The Physical Geography, Geology, Mineralogy and Paleontology of Essex County, Massachusetts; Gleba, Peter (1978): Massachusetts Mineral & Fossil Localities. Emerson, B.K. Geology of Massachusetts and Rhode Island, 1917. (USGS Bulletin 597), p.197, 198, 206. Winchell, A.N. (1900) Mineralogical and petrographic study of the gabbroid rocks of Minnesota, and more particularly, of the plagioclasytes. The American Geologist: 26(4): 197–245. Taylor, R. B. (1964) Geology of the Duluth Gabbro Complex near Duluth, Minnesota: Minn. Geol. Surv. Bull. 44, 63 p.
Hitchcock, Charles Henry (1905). The Geology of Littleton, New Hampshire (Cambridge MA: University Press). William J. Miller. Geology of the Lake Placid Quadrangle. Albany, University of the State of New York, 1919. The Minerals of New York City & Its Environs, New York Mineralogical Club Bull., Vol. 3, No. 1, Manchester, J.G. (1931): 66. The Minerals of New York City & Its Environs, New York Mineralogical Club Bull. Vol. 3, No. 1, Manchester, J.G. (1931): 97. The Minerals of New York City & Its Environs, New York Mineralogical Club Bull. Vol. 3, No. 1, Manchester, J.G. (1931): 96. John Betts website: "The old mines and mineral localities on Anthony's Nose, on the East shore of the Hudson River"
Larsen, E.S. & Schaller, W.T. (1932) American Mineralogist, 17, #10, 457-465. Miller, William J. (1937). Genesis of Certain Adirondack Garnet Deposits (American Mineralogist 23: 399-408). O'Neal, C. (2013), Field collection and visual analysis of the Oregon Sunstone deposits near Plush, Lake County, Oregon; March. Thomas W. Donnelly (1962) Wairakite in West Indian Spilitic Rocks. American Mineralogist, 47, 794-802. Wolff, John E. (1929). Mount Monadnock, Vermont: A Syenite Hill (Journal of Geology, Vol. 37, No. 1, pp. 1-16). Woolley (1987), Alkaline Rocks and Carbonatites of the World.